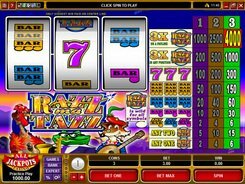 This is a 5-reel 9-payline slot based on a night club theme and released by Microgaming. 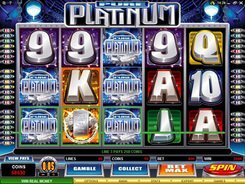 The slot has been developed specifically for ladies, but guys are also welcome to experience a night disco action. 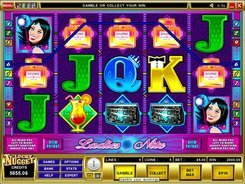 On the reels, you will come across lipsticks, purses, perfumes, cocktails, dancing ladies, a semi-naked waiter, a disco ball and standard playing card icons from 9 through Ace. 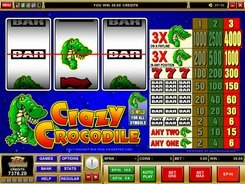 By adjusting a coin size from $0.01 to $1 and the number of coins from 1 to 5, you can place a wager anywhere between $0.09 and $45 to get all the paylines activated. 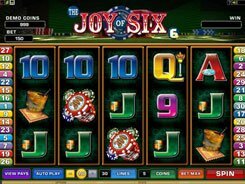 The slot features a wild and a scatter that boost your winning chances. A wild depicted by the Disco Ball has a power to stand in for non-feature symbols to complete a win. 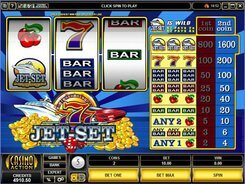 Besides, a wild is the largest payer in the slot awarding a win of your bet times x10,000 or $50,000 if wagering at max. 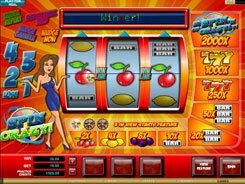 Ladies Nite has a scatter (the Waiter), with three triggering 15 free games, with all wins trebled during the feature.